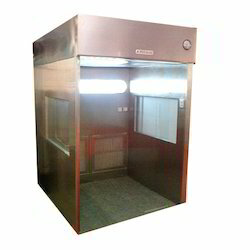 Prominent & Leading Manufacturer from Pune, we offer powder dispensing booth. Equipment is used for dispensing of powder & chemicals to minimize the risk of contaminating of the work area & ensures the health for working person under the laminar air flow. The equipment is based on 3 level of filtration of air circulation. This ensures that the cloud or particles formed by the material dispensed are sucked from the pre-filter, intimated filter & supply with mini pleat HEPA filter. The magnehelic gauge will indicate the pressure difference between the filters. During the initial cycle, we achieve class 100 air with velocity 0.45m/s +/- 20% below working area. FRP blower with aluminum impeller dia 7"x41/2"
10% of the air will throw out with Hepa filters. Looking for Powder Dispensing Booth ?